Today i have made a lovely card for my fiance. Again its another quick and simple card and although our anniversary is in December its better early then never at all. *The card i chose was a a4 piece of mirri card which i folded in half and used a bone fold to ensure a sharp crease. *I then got a plain white 120gsm card and emboss it with a polkadot design. *This was then glued to the red card. 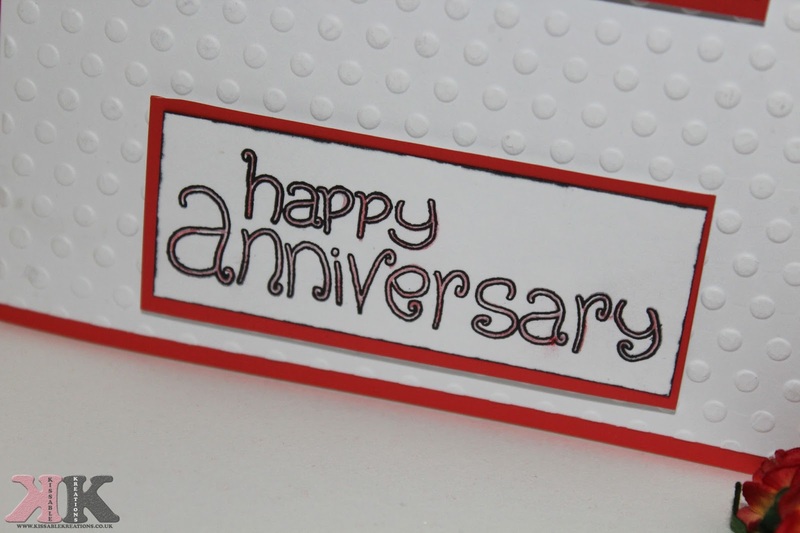 *I did the same with a 'Happy Anniversary' stamp and backed them with the red mirri card which i used for the back card. *Then i glued them to the card and the card was finished. Have a great day carfting. My anniversary is in May so not for a little while yet. This is an adorable card, you did a great job. Love the cute picture. What a cute card! Amazing that you made it! some gorgeous designs, your so talented and clearly work very hard! I much prefer homemade cards to shop bought ones!